Since we are in the midst of moving, I don't get to celebrate Halloween and make all the cool items that I wanted for the big celebration that I wanted to throw. So instead, I'm going to share with you my favorite Halloween crafts from around the web. Hopefully, you'll go check them out and have an amazing party yourself. 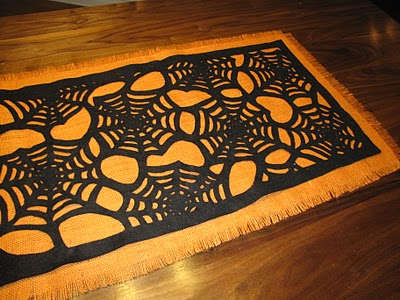 Today I wanted to share this amazing Halloween Table runner from Show, Tell, Share. It's made from black felt and orange burlap. Although it sounds like it takes a "little" time, it doesn't look hard at all. I'm considering even trying to make one of these in the hotel while I sit around. Go check it out and enjoy this cutie sitting on your Dining room table this Halloween.